December | 2011 | WHAT A FEELING! There’s something almost French about the tone and rhythm of Happy New Year, a new movie about a jewelry heist: in the way the narrative pokes along, with more attention to detail than concentration on the big picture. And that’s no accident; this is an adaptation of a French movie of the same title from a few years back, directed by Claude Lelouch. Hollywood regularly exposes its paucity of imagination by stealing (or buying) foreign vehicles, and French comedies are high on the shopping list. Look for a star-heavy American version of the French hit Three Men and a Cradle later this year. This translation of Happy New Year doesn’t try to jazz things up. It’s very low-key, almost apologetic, as it plods on in its shapeless way. 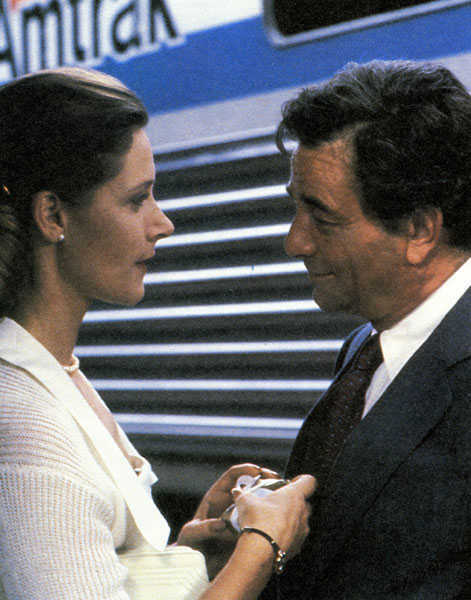 Peter Falk takes the lead role, as a congenially crumpled little guy who masterminds the robberies. He recruits an old pal (Charles Durning) to assist in one final job, a trés chic jewelry store in West Palm Beach. They’re an old-fashioned pair—”dated” might be a better world—who talk about “chasing skirts” and old prison memories. Since the store is physically impenetrable, Falk plots to worm his way in by gaining the trust of the manager (Tom Courtenay) and saleswoman (Wendy Hughes). This he does by applying heavy makeup and pretending to be a doddering old millionaire (and, on alternate visits, the doddering old millionaire’s sister). Eventually, Falk will use the guise to get him in the store after closing time. Falk also contacts Hughes as himself, and soon finds he’s won over by her charm. So will the audience be: Hughes, a gorgeous, very intelligent actress, who has appeared in many Australian films including Lonely Hearts and Careful, He Might Hear You, brings palpable grace to this movie. In fact, there are a few bits and pieces of this film that can be enjoyed along the way. John G. Avildsen, who made the first Rocky, clearly is trying to achieve some honestly touching moments, most of which involve Hughes and Falk and the recurrence on the soundtrack of “I Only Have Eyes for You.” These moments don’t add up, unfortunately, because unlike the necklaces and bracelets in the jewelry store, these ornaments lack a complex setting. 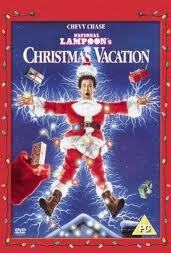 The title of this movie provides a handy send-off for 2011, which was a lively affair. Coincidentally, a send-off to Peter Falk, an actor I liked a lot for Columbo, many other things, but, well, especially Columbo. I never would have believed that any movie could make the huge-grossing (in every sense of the term) Meatballs look good, but here it is: Meatballs Part II, a dead-in-the-water comedy about summer camp. 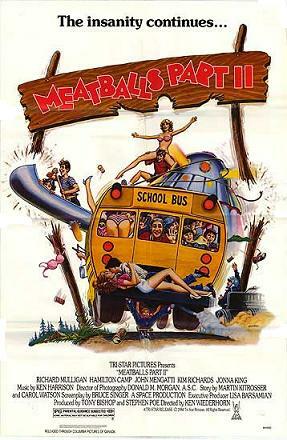 The fact that it’s about summer camp is the sole similarity with the original Meatballs. That film, the most successful Canadian release in history, cleaned up at the turnstiles solely on the strength of a hilarious central performance by Bill Murray. Meatballs Part II doesn’t have Murray, and it doesn’t have anything to replace him. It’s a summer-camp session with the usual jokes about counselors trying to make whoopee under difficult conditions. The main plot has the zany Camp Sasquatch trying to best military Camp Patton (“Where Outdoor Living Molds Killers”) in the annual boxing championship. Sasquatch’s boxing hope (John Mengatti) is a street kid who starts to like a shy girl (Kim Richards). The only remotely humorous moments in the film are had by Hamilton Camp, doing a rabid disciplinarian number as the leader of Camp Patton, and John Larroquette, who plays his swishy assistant. It’s old and disreputable humor, but these two actors have a certain chemistry. Otherwise, funny Richard Mulligan (of “Soap” and S.O.B.) is wasted, as is Paul Reubens, better known to one and all in his comic incarnation as Pee-wee Herman. It’s too bad the producers didn’t see Reubens’ potential, because a passable comedy might have been constructed out of this mess with Reubens as a manic center, as Murray was for Meatballs. There are two oddities about Meatballs Part II. One is that there is an outer-space angle: a little E.T. imitation is dropped off by his parents to enjoy the summer camp. Apparently, he does. Very strange. Also, one of the main campers is a handicapped boy in a wheelchair. This is not a first. There was a paraplegic kid who was a victim—er, character—in the summer camp of Friday the 13th, Part 3. But it’s unusual to see a handicapped character as simply another person in an exploitation comedy. Except for a joke at the beginning when this guy’s motorized wheelchair outraces the camp bus, the handicap is barely mentioned. No cheap pathos, no sob story. He’s just another camper. That’s a peculiarly enlightened attitude for this otherwise uninteresting film. If I’m using the phrase “make whoopee” I must be pretty disengaged. No excuse for that, except the movie itself, which is grueling. The original Meatballs might be awful, but Bill Murray is heroic in it—in his early movies he seems liberated not just as a comedian but as someone unwilling to pretend to be part of a movie. The director of Meatballs Part II is Ken Wiederhorn, who previously helmed King Frat and Eyes of a Stranger, and whose next film would be Return of the Living Dead Part II. That’s a helluva movie marathon for some lost weekend. The plot is set in motion by a car hitting a swan and killing two passengers. The first real line of dialogue is, “How fast does a woman decompose?” The main characters are Siamese twins who were once joined at the ear, shoulder, hip, and ankle. This is the world of Peter Greenaway’s A Zed and Two Noughts, a relentlessly bizarre film that is being marketed as this year’s Blue Velvet. Actually, it’s much more surreal and arch than Blue Velvet, but it shares with that film the capacity for inspiring intense arguments. Greenaway is the British director who made a splash a few years back with The Draughtsman’s Contract, an elegantly elaborate tease. 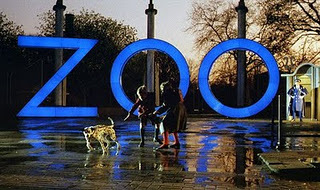 A Zed and Two Noughts—the title is a tricky way of spelling “zoo”—is even more calculated to infuriate, as it piles riddle upon enigma; there are times when the movie resembles a particularly complicated Tom Stoppard play being interpreted by Stanley Kubrick in a nasty mood. 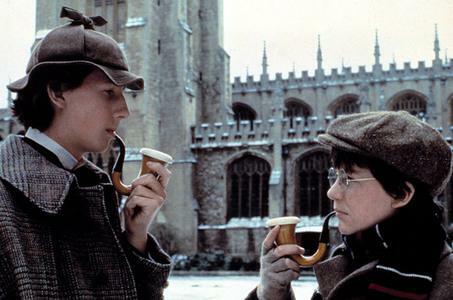 These twins (played by Brian and Eric Deacon) have lost their wives in the car crash caused by the errant swan. Both work at the zoo (the city is unidentified, although it was filmed in Rotterdam), and both find morbid fascination in filming and then viewing the decomposition of various plants and animals. They also remain in the company of the woman (Andréa Ferréol) who was driving the car that struck the swan. Both men become obsessed by her; she goes through the movie gradually losing her limbs, which are amputated for dubious medical reasons. Uh…that’s enough plot. No recounting of the film’s action can convey the weird, ironic, grotesque experience of watching the film itself. Greenaway the draughtsman is building a labyrinth, a maze I found eminently provocative. Greenaway often seems to be too clever for his own good, but he has some suggestive things to say about the way we live, not to mention the way we die and decompose. Whether it’s legitimately effective as a movie, or fundamentally a big, impressive dead-end—well, that can be a starting point for the arguments. Which is probably the way Greenaway likes it. Still in the early blush of Greenaway’s career here. I’m not sure when this review ran, but the movie opened at the Market theater, and it really did start some arguments. Timothy Hutton and Sean Penn are the cream of Hollywood’s hot young actors. They didn’t get there through cuteness or pandering or doing the right talk shows; they got there because they’re very good at what they do. They’re dedicated actors who seem to deliberately eschew the more commercially sensible movies they could make in favor of difficult, challenging projects. Hutton, who took home the best supporting actor Oscar for Ordinary People, has had a couple of box-office duds in a row, Daniel and Iceman, both of which were interesting. Penn, who enjoys looking completely different from one role to the next, scored in Fast Times in Ridgemont High, delved into the harsh prison world of Bad Boys, then appeared as a more-or-less normal human being in Racing with the Moon. They became friends on the set of Taps and decided to make a movie together. 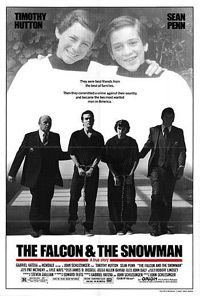 In The Falcon and the Snowman, they’ve picked out what must be their most commercially risky work yet: it’s the true story of two Americans, Christopher Boyce and Daulton Lee, played by Hutton and Penn respectively. The two sold government secrets to the Soviets (Boyce was captured a couple of years ago near Port Angeles). Hutton and Penn obviously are not worried about appearing unattractive to their audience. Boyce and Lee are childhood chums (they were altar boys together), sons of wealthy Los Angeles families. Boyce, who owns a falcon (thus his code name), leaves the seminary at the film’s beginning and takes a job where he is exposed to state secrets; Lee is a two-bit drug dealer (and soon-to-be-addict) who spends a lot of time in Mexico. Boyce gets it into his head that the best way to register disapproval against the immoral behavior of the CIA is to sell information to the Soviets. He enlists Lee as the bagman for the process, and Lee establishes a relationship with the Russian Embassy in Mexico City; he brings them documents and film, they give him money. This set-up effectively provides suspense, with the amateurish spy efforts of Boyce and Lee rubbing up against the efficient espionage systems of the world’s great superpowers. While that situation makes the film sufficiently watchable, there are many problems. It’s always hard to cozy up to a film with traitors as its main characters, even though Hutton and Penn are interesting actors. Hutton plays it straight and suggests plenty of anguish (but not a lot of motivation) for his misdeeds; Penn is pretty off-the-wall, with a characterization that resembles, physically and behaviorally, Robert De Niro’s uncouth lout in The Kind of Comedy (when the Russian agents tensely inform him that he’s been transferred to a less conspicuous Mexico City hotel, Penn looks at them blankly and says, “Does it have a swimming pool?”). Although it gets off to an intriguing start, I liked the film less and less as it went on. British director John Schlesinger, who has long been one of the more overrated figures in world cinema, loves to satirize America (Midnight Cowboy, The Day of the Locust), and he’s up to it again here. In the process, he provides trivializing portraits of the boys’ parents, whose main sin seems to be that they are wealthy. He also establishes a potentially fascinating environment in Hutton’s top-security job, then lets it dribble away—and let’s not even mention Hutton’s girlfriend (Lori Singer, of Footloose), mere window dressing. It’s ironic that Schlesinger should blow it so badly, since he’s just come off his most highly regarded work in years: the BBC production An Englishman Abroad, a charming tale in which Alan Bates plays the real-life figure of—yes—a spy who deals secrets to the Soviet Union. I don’t sound keen on it here, but I have thought of certain scenes from this movie once in a while, and it has a curiosity value somehow. Hutton and Penn hitting golf balls into the ocean—boys of privilege playing games with things they don’t understand. An Englishman Abroad, though, is wonderful. Weirdly, Penn later (years later) hired the real Daulton Lee to serve as his assistant, after Lee was released from prison. The five-week series of David Puttnam’s fine “First Love” films wraps up this week with Winter Flight, which has the distinction of being the longest and most serious of the bunch. It’s also the most problematical. While the earlier films, especially my favorites, Sharma and Beyond and Forever Young, managed a careful blend of good cheer and seriousness, Winter Flight tips more toward the serious, as suggested by its Bergmanesque title. And yet the somber tone is almost too much for its slim plot, which, though it presents a grave enough situation, seems stretched a bit too far. It’s about a virginal 19-year-old British serviceman, Mal (Reece Dinsdale), whose primary social activity is reading the encyclopedia. The first time he ventures into a military bar, he is humiliated by the toughs who regularly hang out there. But his humiliation draws out the compassion of Angie, the bartender (Nicola Cowper), who soothes his wounds and begins dating him. It’s his first romance. It’s not quite hers, as evidenced by the discovery that she’s pregnant, but can’t remember who the father is. Mal knows it isn’t him, but he assumes the stiff upper lip and resolves to do the right thing by her. This situation is nearly identical to Preston Sturges’ classic 1944 comedy The Miracle of Morgan’s Creek. In that film, Betty Hutton saved the day by delivering sextuplets, thus vaulting into celebrityhood. Winter Flight has a surprise ending, too, although of a different kind. This ending, in fact, provides the most original moment in the film, which spends a little too much of its length arguing whether the couple should give the child up for adoption. the movie is sensitively told, Roy Battersby’s direction is unfailingly decent, but the script by Alan Janes does tend to meander. The birth of the child is intercut with an attack on the RAF base where Mal is stationed. It’s a peculiar sequence, since the film has prepared us for the possibility that the attack may be a real one by the Soviet Union, although logic tells us it is more likely a war game. It even sets up some slapstick, as Mal runs around the hospital with his gas mask flopping on his face. It’s an interesting comic try that doesn’t quite jell. Winter Flight is still a good, often moving film (especially the ending). But it doesn’t achieve the plateau of some of the others in the series. That’s the problem with doing exemplary work; you’re always expected to keep up with yourself. These “First Love” movies have been so uniformly excellent, I think we can forgive one of them for being merely good. On the off chance that anybody else remembers these “First Love” movies, I will say that it surprises me to read that my faves were Sharma and Forever Young; Sharma yes, but I thought Kipperbang and Arthur’s Hallowed Ground were my other choices. Sean Bean was also in this one. You are currently browsing the WHAT A FEELING! blog archives for December, 2011.